India women’s football team coach, Maymol Rocky, talked up India’s chances of performing well in the first edition of the Hero Gold Cup which will be held on Indian soil from February 9 onwards. The women's national team will go up against continental rivals - Iran, Myanmar and Nepal. 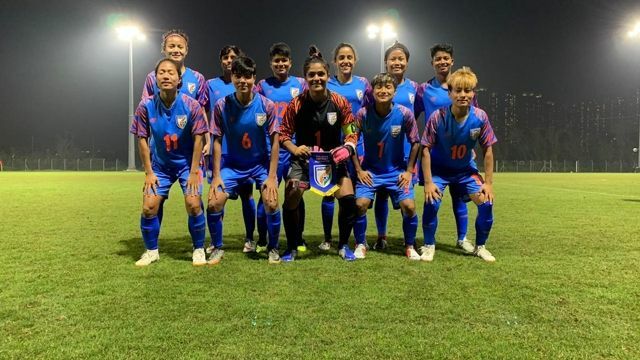 The Indian women’s football team have enjoyed a fine run of wins after beating the likes of Indonesia and Hong Kong in friendly matches. The senior national team is gearing up to go up against continental rivals Iran, Myanmar and Nepal in the Gold Cup which will be played at the Kalinga Stadium in Bhubaneswar from February 9 onwards. In a recent interview with Scroll.in, chief coach Maymol Rocky spoke about the home team’s prospects ahead of the continental tournament against their Asian opponents. Rocky added that the upcoming tournament will be an important opportunity for the hosts’ to unearth hidden gems from within the country. "This is the first time ever that such a tournament is being organised in India. I feel it is a great opportunity for us to create heroes. The players will get to play in front of their home crowd and the spotlight will be on them. We can unearth some real gems at the Gold Cup and show our fans what we are capable of. "Secondly, this competition is the best platform the girls could get. The teams that have been invited are all of high quality. All of them have also qualified for the second round of the Olympic qualifiers. Playing them and the prospect of defeating them will keep us motivated and focused, and help us elevate our game," Rocky said in an interview with Scroll.in. Maymol added that she has great faith in her young squad despite the lack of experience possessed by most of the players. "I have always placed my belief in young players and I feel that they can really take you places. Most of our players are under-23. It’s a young India. So I can mould the team the way I want, and have them play the style of football I want them to. These youngsters have a good understanding of the game and are always willing to learn newer things. "My focus is on improving our finishing in front of goal. We have got better in recent times in converting our chances but there is still a lot we can do. I’m certain that it is a matter of time that things fall into place and we improve our scoring rate," Rocky added.